Paul Nazzaro is no stranger to the biodiesel industry and has been a huge champion for the advanced biofuel in the Northeast for nearly two decades. During the 2016 National Biodiesel Conference & Expo in Tampa, Florida, Nazzaro participated in several panel discussions focused on how to get more biodiesel into the Northeast as each year, more legislation is passed to curb emissions and ultimately promote renewable energy. BioHeat in particular is really gaining ground. Yet distribution challenges need be overcome in order to get more biodiesel products into the northeast. Nazzaro said in an interview after the panel discussion that compared to other areas of the country, there are very few terminals where the fuel can be blended and distributed. 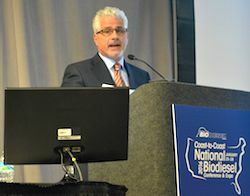 When asked who is responsible for paying to get more terminals, such as the biodiesel industry or the petroleum industry, Nazzaro said ultimately the cost will fall on consumers. But if they keep asking for biodiesel products, he stressed, suppliers will listen and down the road, biodiesel is not only more environmentally friendly, it will cost consumers less. Nazzaro is working with a team to help overcome distribution and supply challenges to help ensure that the biodiesel industry can deliver what they promise: high value, advanced, renewable bioproducts.